S.T.A.L.K.E.R. 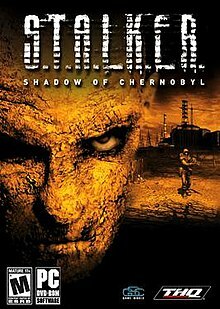 : Shadow of Chernobyl is a first-person shooter survival horror video game developed by Ukrainian game developer GSC Game World and published by THQ. The game is set in an alternative reality, where a second nuclear disaster occurs at the Chernobyl Nuclear Power Plant Exclusion Zone in the near future and causes strange changes in the area around it. The game has a non-linear storyline and features gameplay elements such as trading and two-way communication with NPCs. The game includes role-playing and first person shooter elements. In S.T.A.L.K.E.R, the player assumes the identity of an amnesiac "Stalker", an illegal explorer/artifact scavenger in "The Zone", dubbed "The Marked One". "The Zone" is the location of an alternate reality version of the Zone of alienation surrounding the Chernobyl Power Plant after a fictitious second meltdown, which further contaminated the surrounding area with radiation, and caused strange otherworldly changes in local fauna, flora, and the laws of physics. "Stalker" in the context of the video game refers to the older meaning of the word as a tracker and hunter of game or guide. The background and some terminology of the game ("The Zone", "Stalker") are borrowed from the popular science fiction novella Roadside Picnic by Boris and Arkady Strugatsky and the 1979 Andrei Tarkovsky film Stalker that was loosely based on it, as well as Stalker, the film's subsequent novelization by the original authors. The term "Stalkers" was later used for the scientists and engineers who explored the interior of Chernobyl's "sarcophagus" after its hasty construction in 1986. In addition, 'The Zone' is also a term used to refer to the 30 kilometer Chernobyl Exclusion Zone, established after the accident. On 11 July 2007, GSC Game World announced a prequel, S.T.A.L.K.E.R. : Clear Sky, which was released on 15 September 2008. On 30 April 2009, GSC Game World announced a sequel, S.T.A.L.K.E.R. : Call of Pripyat, which was released worldwide in February 2010. S.T.A.L.K.E.R. takes place in an area called "The Zone", which is based on the real-life Chernobyl Exclusion Zone and partly on the settings of the source novel and film. It encompasses roughly 30 square kilometers and features a slice of Chernobyl extending south from Chernobyl Nuclear Power Plant; geographical changes for artistic license include moving the city of Pripyat into this area (it is actually to the north-west of the power station), although the city itself is directly modeled on its real-life counterpart, albeit smaller in size. After the initial Chernobyl Disaster, attempts were made to repopulate the area, primarily with scientists and military personnel. However, in 2006, almost 20 years after the first incident, a second disaster occurred, caused by the C-consciousness (rus. "О-Сознание" which corresponds with "осознание" - "realisation, awareness", ukr. "О-свідомлення") program, killing or mutating most of the inhabitants. S.T.A.L.K.E.R. begins years later, after people have begun coming to the zone in search of money, valuable artifacts, and scientific information. In keeping with the post-nuclear decay within The Zone, extreme radiation has caused mutations among animals and plants in the area. As such, creatures within The Zone are vastly different from their real-world counterparts: dogs, boars, crows, and many more. Additionally, some areas of The Zone such as Yantar contain mutated humans known as zombified STALKERS, who have become affected by the so-called Brain Scorcher. Bloodsuckers are large monsters with sharp claws and tentacles for a mouth, which can turn invisible. Snorks are the most human of the four; they are nicknamed "Snorks" as a reference to the cartoon of the same name, and in-universe for their gas masks, which resemble a snorkel. They are agile and use kicking and clawing to kill their prey. The Poltergeists are a somewhat invisible mutant that is covered by a ball of electricity and, when killed, are revealed to be an extremely mutated human missing all of his body below his hips. Pseudogiants are the deadliest threats in The Zone: a giant mutated ball of several humans combined, which have a grotesquely stretched face, several smaller faces along its body, and has two strong legs to support its weight. Controllers are a human-like figure with an overly large head, that use psi powers to attack the player, both directly through a throwing type gesture, when a line of sight can be made. Controllers also use a passive attack, which makes the player woozy and disoriented in short bursts, before flashing red as a warning when one gets too close. Prolonged exposure up close to a Controller will leave the player's vision blurry, making it difficult to aim for a length of time. The duration varies in severity and recovery depending on how long the player was exposed to the psi powers of a Controller. Artificial Intelligence of wildlife is highly developed and presents many realistic behaviors, such as fights over food and pack mentality, which can be observed in non-scripted events. The game engine was designed so that animal behavior is calculated even if the player is in a different part of the Zone. Anomalies produce Artifacts, the valuable scientific curiosities that make the Zone worth exploring monetarily. As well as being traded for money, a number of Artifacts can be worn so that they provide certain benefits and detriments (for example, increasing a stalker's resistance to gunfire while also contaminating him with small amounts of radiation) although certain rarer Artifacts provide benefits without any negative effects. Artifacts are found scattered throughout the Zone, often near clusters of anomalies. Radiation caused by the nuclear incidents at Chernobyl occurs in specific invisible patches throughout The Zone. Although most areas in The Zone have no radiation, areas near abandoned construction equipment that was used in the post-accident clean-up, certain military vehicular wreckage and a variety of other locations create fields of radiation of varying intensity and size, some of which cannot be passed through without the proper protective equipment and anti-contaminant agents. In the real world, gas masks, filtration helmets, radiation suits, etc. would be used but in the game world, the equipment is simplified into various sets of armor that have different levels of radiation protection. Additional radiation resistance may be conferred by some artifacts and radiation sickness may be treated by medication or by consuming vodka. S.T.A.L.K.E.R. is primarily a first-person shooter survival horror video game, but it also features many RPG elements. The player does not gain additional abilities or statistics like most RPGs (though the player does level through game play from "novice" to "expert" which has slight effects on the ability to aim accurately), but is instead allowed to attach artifacts which can increase or decrease player attributes. Artifacts found within the zone have both positive and negative effects except for some rare artifacts which have only positive attributes. There are a large number of items in the game, so the player has customization choices which are constrained primarily by how much exploring they do. It was revealed by the developers that the Artificial Intelligence had to be extremely slimmed down, as it could actually complete the game by itself if given the task, and several attack tactics were cut for difficulty reasons, including the ability for enemies to heal wounded allies, give orders, and throw grenades with pinpoint accuracy. The Zone is a large and varied area, consisting of wilderness, human settlements, and several heavily guarded military bases. However, the game world is not a true contiguous world, but rather 18 different maps separated by loading screens. Transfer from one area of the Zone to another can only be accomplished at certain specific passageways; wire fences and extreme radiation levels block the player from attempting to cross the map in any other area. When the player enters a highly irradiated area, they will begin to receive radiation poisoning. During this time, a radiation icon appears on the screen and fades through from green to yellow to red, signifying the strength of the poisoning, which grows the longer the player remains present in the affected areas. The stronger the poisoning, the faster the player's health decreases. Unless the player dies from damage caused by radiation poisoning, there are no permanent effects from contracting it other than health loss. However, radiation will persist and continue to drain health until either radiation medication or a substantial amount of vodka is consumed. Radiation can primarily be avoided by wearing certain artifacts that neutralize radiation or more advanced suits that will effectively protect the player from radiation. In much the same way radiation works as a gameplay mechanic, the player will occasionally become hungry during their travels. During this state, an icon of a crossed fork and spoon will appear. Consuming in-game food items returns the player state from hungry to not hungry, which removes the negative impact on stamina that the hunger status gives. However, if one ignores eating, it will result in the death of the player in a certain amount of time. Unlike reality, not eating in game results in a much quicker death. As with radiation and hunger, bleeding is another state of detriment which the player must try to avoid or manage while playing the game. Bleeding occurs when the player sustains certain kinds of injuries of certain severity (such as being shot or stabbed). The player will lose the amount of health determined by the landed blow and will continue to lose small amounts of health as they hemorrhage. Bleeding can sometimes stop on its own, but the player can prevent further bleeding by applying bandages or using first aid kits, thereby preventing further health loss. The game begins with an unconscious, wounded stalker (the player character) being brought to Sidorovich, a black-market trader operating inside the Zone of alienation (or simply "The Zone"). Sidorovich is able to save his life, but the wounded stalker is amnesic; the only clues to his identity are a tattoo on his arm of the acronym "S.T.A.L.K.E.R." and his PDA which contains only one entry in the to-do list: "Kill Strelok." The amnesic stalker is dubbed "Marked One" by Sidorovich. The Marked One repays Sidorovich by performing certain tasks, and in the process receives information about Strelok's possible whereabouts. With no other leads to his past or the cause of his amnesia, the Marked One follows the information from contact to contact, tracing Strelok's past movements and learning more about his supposed assassination target; the more he learns about him, the more he recovers scattered memories. Eventually, the Marked One follows a lead to a factory in Yantar. Yantar is the home of a Brain Scorcher, a field which effectively destroys the mind of anyone who comes within its range, zombifying and turning them violent and hostile. Scientists studying the phenomenon determine that it is man-made and recruit the Marked One to enter a secret laboratory underneath the factory to disable it. Information taken from a body in the lab directs the Marked One to track down a member of Strelok's group named Doctor. In an attempt to reach him in Strelok's underground base, the Marked One inadvertently triggers an explosive booby trap and is nearly killed, only to be rescued by a man named Doc. While he is incapacitated Doc speaks to the Marked One about the rumor of a giant artifact known as the "Wish Granter" located somewhere in the center of the Zone, but also indicates that the Marked One is Strelok, calling him by that name. However, before Strelok can fully recover, Doc leaves. Further leads send Strelok towards the Chernobyl Nuclear Power Plant, where the Wish Granter is believed to be located. However, the journey to Chernobyl itself has been all but impossible due to the presence of another, larger Brain Scorcher south of Pripyat, as well as the "Monolith" faction of extremely fanatical stalkers who worship the Wish Granter, referring to it as the Monolith, and kill anyone attempting to access it. Strelok makes his way through a dense forest south of Pripyat and deactivates the second Brain Scorcher, re-opening the path to the abandoned city. Pripyat is in chaos as stalkers of multiple factions, including the military, clash with the heavily armed and numerous Monolith forces. Strelok eventually makes his way to the Chernobyl facility, also held and viciously fortified by Monolith forces. After fighting his way through both Monolith and military troops, Strelok discovers the giant Wish Granter artifact inside the sarcophagus as well as a secret laboratory underneath it. Inside the heavily defended lab is a large holographic terminal, through which an entity calling itself the "C-Consciousness" communicates. It readily answers Strelok's questions, revealing what it is, who Strelok is, and the events prior to his amnesia. In the aftermath of the Chernobyl disaster, the Soviet Union decided to use the Exclusion Zone for special research into the human mind. Results included enhanced ESP, psychic weapons, and the eventual formation of a hivemind of seven neurally-linked scientists known as the C-Consciousness. After the dissolution of the Soviet Union, the self-aware C-Consciousness took control of the Zone and continued its research. It attempted to bring about world peace through global mind-control by directly interacting with the noosphere; however, these attempts resulted in the unintentional twisting of the physical terrain around Chernobyl as well as the mutation of resident life forms, creating the Zone. In an attempt to hide its existence, the C-Consciousness created the two Brain Scorcher fields and erected a Monolith artifact - the Wish Granter - in the center of the Zone, which it uses to brainwash any stalkers who reach it; brainwashed stalkers are tattooed with the "S.T.A.L.K.E.R." acronym and reprogrammed to serve the C-Consciousness. Rumors of the Wish Granter began to spread throughout the Zone. A group of four stalkers, Strelok, Ghost, Fang, and Doc, attempted to reach the Wish Granter by battling on their way to Chernobyl, but after encountering the fanatical Monolith faction and a man named Scar they were forced to retreat. Strelok was knocked unconscious during a "blowout" while the others were able to escape. On the way back, Fang was killed by a sniper in Pripyat. Some time later, Ghost was killed in the Brain Scorcher control facility under Yantar. The unconscious Strelok was discovered by the C-Consciousness; unaware of his identity, it had him brainwashed, reprogrammed him and mistakenly assigned him the task of killing himself. On the way out of the Zone, the truck carrying the still unconscious Strelok was destroyed in a lightning storm and he was discovered by another passing stalker, leading to his discovery. Once the C-Consciousness has finished answering Strelok's questions he is given a choice: merge with the C-Consciousness to ensure its continued existence, or stop the C-Consciousness from continuing its experiments. Strelok refuses to assist the C-Consciousness. He is transported to the exterior of the Chernobyl plant, where he navigates his way through teleportation anomalies, elite Monolith soldiers, and mutants in order to reach the source of the C-Consciousness. Once inside, Strelok shoots the encapsulated scientists which form the C-Consciousness. Strelok then kills his own C-Consciousness unit and is released out of the nightmare. Afterwards, Strelok is shown standing in a grassy field, watching the sky as the clouds break and the sun comes out. The Zone is apparently gone. He questions whether or not he made the right decision, but as he lies down in the grass he concludes that while he may never know what was right, he is happy that he survived. He lies down on the grass and falls asleep. The X-Ray Engine is a DirectX 8.1/9 Shader Model 3.0 graphics engine. Up to a million polygons can be on-screen at any one time. The engine features HDR rendering, parallax and normal mapping, soft shadows, motion blur, widescreen support, weather effects and day/night cycles. As with other engines that use deferred shading, the X-Ray Engine does not support multisample anti-aliasing with dynamic lighting enabled. However, a different form of anti-aliasing can be enabled with dynamic lighting which utilizes an edge detection algorithm to smooth edges between objects. The game takes place in a thirty square kilometer area, and both the outside and inside of this area are rendered to the same amount of detail. Some textures in the game were photographs of the walls in the developers' studio. 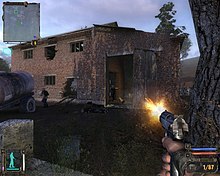 A screenshot demonstrating the abilities of S.T.A.L.K.E.R. 's rendering engine after enabling anti-aliasing and tone mapping. The X-ray engine uses GSC Game World's proprietary ALife artificial intelligence engine. ALife supports more than one thousand characters inhabiting the Zone. These characters are non-scripted, meaning that AI life can be developed even when not in contact with the player. The NPCs have a full life cycle (task accomplishment, combat, rest, feeding and sleep) and the same applies to the many monsters living in the Zone (hunting, attacking stalkers and other monsters, resting, eating, sleeping). These monsters migrate in large groups. The non-scripted nature of the characters means that there are an unlimited number of random quests. For instance, rescuing stalkers from danger, destroying stalker renegades, protecting or attacking stalker camps or searching for treasure. The AI characters travel around the entire Zone as they see fit. Numerous tactics can be employed to complete the game, such as rushing or using stealth and sniping. The NPCs will react in a different way to each of them. S.T.A.L.K.E.R. 's NPCs plan ahead by "Goal-Oriented Action Planning" to achieve this. S.T.A.L.K.E.R. uses a heavily modified version of the ODE physics engine. Ragdoll physics, destructible objects, realistic bullet ballistics and skeletal animation can all be found in the game. Bullets are affected by gravity, bounced against solid surfaces at oblique angles, and firearms are highly inaccurate when fired without aiming. To score consistent hits at medium or long range, players must aim using the iron sights on their guns. Additionally, hit damage is pseudo-realistic, and the player can die after only being shot a few times (although later in the game various armor suits and artifacts can be acquired that increase the player's resistance to damage). Late-game depends heavily on scoped weaponry due to the well-armed and armored enemies that keep their distance from the player. A weather system is integrated into various parts of the landscape and allows a variety of weather effects, such as sunshine, storms and showers. The weapons available, behavior of the AI, game tactics and ranking systems depend on the weather. Unlike most dynamic weather systems, the game features complete dynamic wet surfaces such as pavement, concrete, brick walls, etc. The game features ambient music by Frey Vladimir aka "MoozE". It also has three songs from the Ukrainian band Firelake. The game was first announced in November 2001 and had its release date, originally in 2003, pushed back several times. Meanwhile, hundreds of screenshots of the game had been released, as well as a dozen preview video clips, accompanied by other forms of promotion by GSC, such as inviting fans to their offices in Kiev to play the current build of the game. However, due to the delays some considered S.T.A.L.K.E.R. to be vaporware. In late December 2003, a pre-alpha build of the game was leaked to peer-to-peer file sharing networks. This build, marked as version 1096, inadvertently acted as a fully functional tech demo of S.T.A.L.K.E.R. 's engine, despite its lack of NPC enemies and fauna. In February 2005, THQ expressed a desire to see the game released toward the end of its 2006 fiscal year (31 March 2006) but maintained that no release date had been set. In October 2005, THQ confirmed that S.T.A.L.K.E.R. would not be out "until the second half of THQ's 2007 fiscal year - October 2006 at the earliest." In February 2006, THQ revised this possible release window, saying the game would not be in stores until the first quarter of 2007. In an interview at the Russian Gameland Awards, PR Manager Oleg Yavorsky indicated that release was planned for September 2006. In 2006, the game came 9th in Wired's Vaporware '06 award. THQ ran a competition in January 2007 offering the winners the chance to play the beta version of S.T.A.L.K.E.R., in a 24-hour marathon session. The event, scheduled to take place on 24 January 2007, was subsequently changed to a 12-hour session days before it was supposed to occur. On the morning of the event, the winners were met at the venue by the THQ staff that had organized the event, who were embarrassed to report that they had been unable to get any copies of the game. In late February GSC managed to release a public beta. A multiplayer demo was released to the public on 15 March 2007. On 2 March 2007, it was announced that the game went gold. At the end of February 2009, due to popular demand GSC Game World released "xrCore" build 1935, dated 18 October 2004. It uses a completely different physics engine with many cut monsters, levels, and vehicles. It was also significantly larger than the retail release. It is however somewhat unstable, but features the full game along with a "fully functional ALife system". It is currently available for free download from the GSC servers and mirrors. S.T.A.L.K.E.R. : Shadow of Chernobyl received generally positive reviews, with critics praising the game for its style and depth while criticising technical issues, mentioning the number of bugs present. It received a score of 82.70% on GameRankings and 82/100 on Metacritic. The game design of the Zone was one of the most favored aspects. GameSpot praised the style and level design, stating "This is a bleak game, but in a good way, as it captures its post apocalyptic setting perfectly", while Eurogamer called it "one of the scariest games on the PC", going on to say "Like the mythological Chernobyl zone it is based upon, this game is a treacherous, darkly beautiful terrain." Game Informer did not find the gameplay particularly innovative, but still complimented the basic FPS design, saying, "S.T.A.L.K.E.R. isn’t the revolution that we all hoped it would be. It is, however, a respectable and sometimes excellent first-person adventure" whereas GameSpot called it "one of the best ballistics models ever seen in a game, and as a result, firefights feel authentic as you try and hit someone with what can be a wildly inaccurate rifle". Upon release, S.T.A.L.K.E.R. was criticized for having numerous bugs, especially when used with the then-recently released Windows Vista. IGN found the game "tended to stutter quite often, sometimes pausing for three or four seconds at regular intervals, which occurred on two different Windows XP computers at maximum visual quality," and some cases of game crashing glitches. Another criticized aspect was the story, which to some reviewers was "incoherent" and which PC Gamer stated "fails in the specific story of your character". In December, S.T.A.L.K.E.R. won the Special Achievement award for Best Atmosphere in GameSpot's Best and Worst 2007, stating that "S.T.A.L.K.E.R. captures the 'ghost town' nature of the zone, from the abandoned cities to the overgrown wilderness. Then, the game adds its own paranormal elements, which help make a spooky environment almost terrifying at times". S.T.A.L.K.E.R. received a "Silver" sales award from the Entertainment and Leisure Software Publishers Association (ELSPA), indicating sales of at least 100,000 copies in the United Kingdom. As of September 2008, S.T.A.L.K.E.R. has sold 2 million copies worldwide. GSC Game World CEO Sergiy Grygorovych has said "We are very pleased that S.T.A.L.K.E.R. became so popular among players from all over the world. Financial success will allow us to develop S.T.A.L.K.E.R. in different directions as a brand." S.T.A.L.K.E.R. : Clear Sky is a prequel set a year before Shadow of Chernobyl. The game world consists of a mix of 50% old, redesigned areas, and 50% completely new levels. The updated engine supports the Inverse Kinematics animation system, allowing more and better animations. New effects such as volumetric lighting were also included. In general, the developers sought to take the basics of everything in Shadow of Chernobyl and enhance them. Better AI, graphics and new game-play additions, such as faction wars, were some of the added features. S.T.A.L.K.E.R. : Call of Pripyat is a sequel set after the events in Shadow of Chernobyl. The game features new areas recreated by their true-to-life locales such as Pripyat town, Yanov Railway Station, Jupiter Factory, Kopachi Village and more. Other features include an improved A-Life system, a new player interface, a brand-new story and a number of unique characters, two new monsters and behavior and abilities, an extended system of side quests, a sleep function and a free play mode. In 2008, a group of fans set out to create a mod aimed at restoring cancelled features from the early versions of the game. On 26 April 2014, the mod was released as a standalone game named "S.T.A.L.K.E.R. : Lost Alpha". Rock, Paper, Shotgun's Craig Pearson praised many aspects of the mod, but also noted the presence of stability problems and bugs, stating "S.T.A.L.K.E.R. will always break, and this version seems particularly perilous". In May 2018, Sergey Galyonkin, the creator of Steam Spy, tweeted that GSC Game World would create a S.T.A.L.K.E.R. 2, using Unreal Engine 4. Shortly the GSC website mentioned that the company was working on S.T.A.L.K.E.R. 2, and a teaser website appeared mentioning the release date of 2021. Many media outlets mentioned the fact that the S.T.A.L.K.E.R. 2 teaser site was linked by both the company website and facebook page. It was suggested that the game was still in the design phase and was announced just before E3 2018 at that point "so the devs could find a publisher". ^ Kroft, Steve (13 December 1999). "Chernobyl Revisited". CBS News. ^ "GSC Game World - News". www.gsc-game.com. Retrieved 11 April 2018. ^ "bitComposer Games - Products". www.bit-composer.com. Retrieved 11 April 2018. ^ "S.T.A.L.K.E.R. : Shadow of Chernobyl". www.stalker-game.com. Retrieved 11 April 2018. ^ "S.t.a.l.k.e.r. Zone World". GSC Game World. Retrieved 24 July 2008. ^ "Electro". GSC Game World. Retrieved 28 January 2011. ^ "Vortex". GSC Game World. Retrieved 28 January 2011. ^ "Burner". GSC Game World. Retrieved 28 January 2011. ^ "Artefacts". GSC Game World. Retrieved 28 January 2011. ^ "STALKER Vehicle-Mod". pcgames.de. Retrieved 11 April 2018. ^ "Transport Mod - S.T.A.L.K.E.R. - GameFront". filefront.com. 8 April 2007. Retrieved 11 April 2018. ^ Shishkovtsov, Oles. "Deferred Shading in S.T.A.L.K.E.R." GSC Game World. Archived from the original on 16 July 2011. Retrieved 12 August 2010. ^ "PC Gamer UK" (135). May 2004: 38–41. ^ "Game Review Only" (28 November 2007). "S.T.A.L.K.E.R. : Shadow of Chernobyl". Archived from the original on 12 March 2008. Retrieved 28 November 2007. ^ "Top 10 Tuesday: Modern Vaporware". IGN. Retrieved 31 March 2007. ^ "STALKER Pre-Alpha Leaked". MegaGames. 2 January 2004. Archived from the original on 19 June 2008. Retrieved 18 June 2008. ^ Adams, David. "S.T.A.L.K.E.R. Delayed". IGN. Retrieved 31 March 2007. ^ "Stalker". GameSpot. Retrieved 11 April 2018. ^ Sinclair, Brendan (3 February 2006). "THQ announces holiday results, delays S.T.A.L.K.E.R." gamespot.com. Retrieved 11 April 2018. ^ Calore, Michael (27 December 2006). "Vaporware '06: Return of the King". Wired. Retrieved 21 January 2011. ^ ""S.T.A.L.K.E.R." Goes Gold". GSC Game World. 2 March 2007. Retrieved 13 May 2007. ^ "S.T.A.L.K.E.R. build 1935 released for free download" Archived 22 June 2009 at the Wayback Machine ClanBase. Retrieved 1 March 2009. ^ "S.T.A.L.K.E.R. : Shadow Of Chernobyl, build 1935, Oct 18, 2004". gsc-game.com. Retrieved 11 April 2018. ^ a b "S.T.A.L.K.E.R. : Shadow of Chernobyl Reviews". GameRankings. Retrieved 7 November 2007. ^ a b "S.T.A.L.K.E.R. : Shadow of Chernobyl Reviews". Metacritic. Retrieved 7 November 2007. ^ a b Rossignol, Jim (7 March 2007). "Reviews = S.T.A.L.K.E.R. : Shadow of Chernobyl // PC". Eurogamer. Retrieved 7 November 2007. ^ a b c d Ocampo, Jason (20 March 2007). "Reviews = S.T.A.L.K.E.R. : Shadow of Chernobyl // PC". GameSpot. Archived from the original on 12 October 2007. Retrieved 7 November 2007. ^ Kuo, Li (5 February 2007). "GameSpy: S.T.A.L.K.E.R. : Shadow of Chernobyl". GameSpy. Retrieved 10 August 2009. ^ a b Biessener, Adam (March 2007). "S.T.A.L.K.E.R. : Shadow of Chernobyl review". Game Informer. Archived from the original on 27 October 2007. Retrieved 7 November 2007. ^ a b Onyett, Charles (19 March 2007). "S.T.A.L.K.E.R. : Shadow of Chernobyl Review". IGN. Retrieved 7 November 2007. ^ "GamesRadar+". computerandvideogames.com. Retrieved 11 April 2018. ^ "ELSPA Sales Awards: Silver". Entertainment and Leisure Software Publishers Association. Archived from the original on 21 February 2009. ^ Caoili, Eric (26 November 2008). "ELSPA: Wii Fit, Mario Kart Reach Diamond Status In UK". Gamasutra. Archived from the original on 18 September 2017. ^ "S.T.A.L.K.E.R. official site". GSC Game World. 3 September 2008. Retrieved 3 September 2008. ^ "Impressions: Stalker: Lost Alpha". rockpapershotgun.com. 12 May 2014. Retrieved 11 April 2018. ^ "STALKER 2 announced, scheduled for 2021 release". Polygon. 15 May 2018. Retrieved 16 May 2008. ^ "S.T.A.L.K.E.R. 2 is coming in 2021, apparently". Destructoid. 15 May 2018. Retrieved 16 May 2008. ^ "S.T.A.L.K.E.R. 2 is coming in 2021, apparently". PC Gamer. 15 May 2018. Retrieved 16 May 2008. Websites are easy to fake, but the GSC Game World Facebook page contains a link to the site, as does the GSC website, which also states explicitly that "currently [the] company is developing Stalker 2." ^ "STALKER 2 was only announced so the devs could find a publisher". PCGamesN. 29 May 2018. Retrieved 17 June 2008. the game is currently in the design doc phase, and developers GSC GameWorld are hoping to secure a publisher at E3.(... )Galyonkin, however, suggests that that date could be wishful thinking, as the game doesn’t actually have a publisher at this point. Wikimedia Commons has media related to S.T.A.L.K.E.R. : Shadow of Chernobyl.